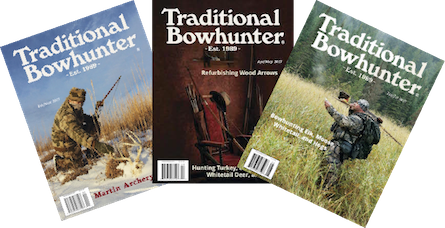 Traditional bowhunting has taken me to some wonderful places and introduced me to some great friends and accomplished hunters. 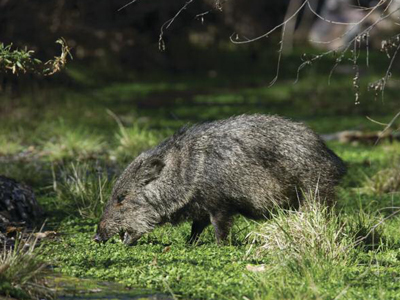 It seems that every new area, new big game species, and new experience has its own secrets to success. As bowhunters, it’s important to keep an open mind, learn skills from others, and enjoy every challenge we encounter. 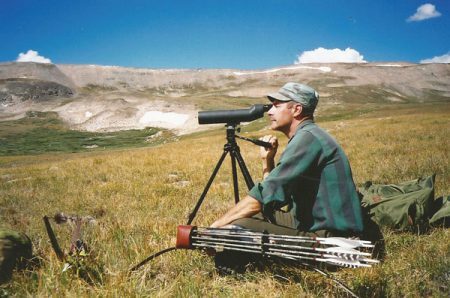 Good optics allow hunters to “hunt with their eyes” for mule deer above timberline in Colorado. A cold Colorado wind searched out the gaps in my wool clothing as we sat watching a distant slope become illuminated by the rising sun. My friend, Denny Sturgis Jr., and I were hunting mule deer with Marv Clyncke. “The way we hunt around here is with our eyes,” Marv boomed out in his strong baritone voice without even moving his eye away from the spotting scope. There was no concern about loud talking spooking our game. We were hunting mule deer that couldn’t even be seen with the naked eye. With our binoculars, we searched the open slopes above timberline on distant mountains looking for tiny spots the color of deer. Checking those spots with a powerful spotting scope proved that some of them actually were deer. I was getting cold and would have welcomed the hike required to get a better look at the distant deer, but Marv showed no sign of moving. “Use your eyes. 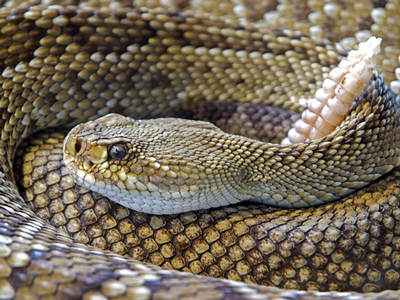 Save your legs for packin’ meat,” Marv boomed, his eye still glued to the scope. It seemed strange to be carefully stalking a bedded deer we couldn’t see while standing in the open within plain sight of each other. Ten minutes later we had the stunted willow patch pretty well surrounded. Then, a gust of wind must have carried man scent into the brush. Suddenly, a huge mule deer buck with a rack of antlers like I’d seen only in magazine pictures stood up in the willows. Several arrows rattled harmlessly through the brush as the deer bounded off in that peculiar mule deer gait. We watched in silence as the monarch covered the half mile of open ground before going over the ridge top out of sight. “Well, that’s that,” Marv boomed. The memorable stalk above timberline ended without meat to pack, but it was a great experience. I won’t soon forget Marv’s open country hunting methods. “Shhhh,” Michael hissed. I stopped moving immediately and stood as if frozen so I wouldn’t make any rustling sounds that might impair his hearing. The term “quiet clothing” had taken on a whole new meaning while hunting with Michael. “One over there,” he said as he pointed. “And two over there,” he continued, pointing the other way. “I never heard them call,” I whispered. I don’t blame you if you don’t believe that little story. I would have trouble believing it myself if I hadn’t later seen the three moose Michael had heard. A big cow accompanied by a gangly calf and a young “bootjack” bull were feeding nearby unaware of our presence. 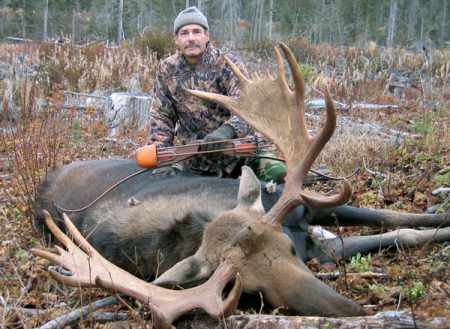 I learned a lot while moose hunting with Michael. He is an excellent woodsman and a well-disciplined hunter who pays attention to details. From his example and actions I remembered to hunt all the time, never ever talk above a quiet whisper, walk slowly in a natural moose-like rhythm, stop and stand motionless for long periods of time as a moose is prone to do, use binoculars continuously while hunting, and most important of all, to listen. In our daily lives we learn to tune out and ignore the unimportant noise around us. But in the silence of the boreal forest, there are no unimportant sounds. While standing motionless, listening, I’d ask myself, “What do I hear?” A far off raven, a pine squirrel, wind in the pines, wait…was that a moose? The vocalizations of undisturbed moose can be surprisingly loud sometimes. At other times, the calls coming from such a large animal can be surprisingly soft. I did take a nice bull moose while hunting with Michael, but even more important, I learned to hunt with my ears. It takes “legs” to hunt mountain goats in the high country of Alaska. The author poses with his billy where it fell. The way you hunt mountain goats is with your legs. A good measure of mental stamina helps as well. “Good thing we didn’t wait until we were old enough to retire before doing this hunt,” my friend, Jim Jarvis, gasped. We were both resting, bent over with hands on knees to help relieve the weight of the seventy-pound packs on our backs. Sweat was dripping from my chin and my leg muscles were burning. We were half way up an un-named Alaska mountain, struggling to reach a level spot to set up camp for an unguided mountain goat hunt. “Yeah, I’m already too old to do this,” I groaned. For the next seven days we scaled cliffs, crossed glaciers, climbed steep snowfields and hunted the high peaks. The rain slicked rocks on the mountainsides were treacherous. We suffered from aching muscles, bruised feet, blisters, swollen knees, and fatigue. 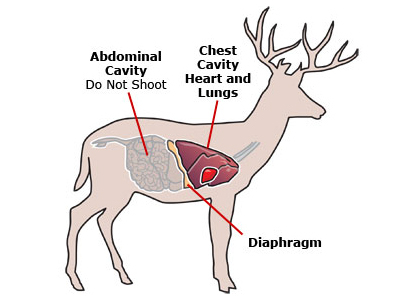 Although I had trained heavily at home for this hunt, I wasn’t ready for the hardships. My legs ached every night, and I was often jolted awake by muscle cramps. Yet it was the most beautiful place I’ve ever seen. I’ve never experienced air any fresher, sky any bluer, snow any whiter, or plant growth any greener. After a rain shower, rainbows appeared both in the sky and in the blue glacier ice. A turquoise colored lake below camp was highlighted with floating icebergs calved from the glacier. Wind whistled like music through the mountain peaks with a background orchestra of rushing waterfalls. The whole area was pristine and untouched. In all my wanderings, I’ve never seen a place so wild and free. Late one day I spotted a goat feeding in an area where I could try a stalk if I were careful. Circling above him, I crossed a dangerous rockslide without incident, came down a narrow snow chute, and closed in on him. A nearby waterfall hid any sound I made as I approached within bow range. The big billy had probably never seen a man before. He presented me with a standing shot and I took advantage of it. He immediately went out of sight over the edge of a cliff. Looking around, I was surprised to find that the stalk had taken me out on a narrow ledge that ended at a rock wall. I couldn’t find a way down, and it was getting dark. It would be dangerous and foolish to try to go back and cross that rock slide in the dark. I was prepared, so I decided to put on all the clothes in my pack, wrap up in my space blanket, and wait for daylight. After I reached camp shortly after daylight the next morning, Jim and I went back to look for my goat. Circling below the area, we located him where he had come to rest after sliding down a small waterfall. 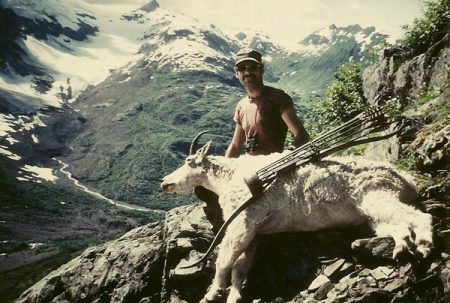 Reaching my mountain goat and finding both horns still intact was a highlight of my bowhunting career. To me, mountain goat trophies are not measured by the size of their small, black horns, but by the effort expended and the satisfaction derived from the experience of hunting them. 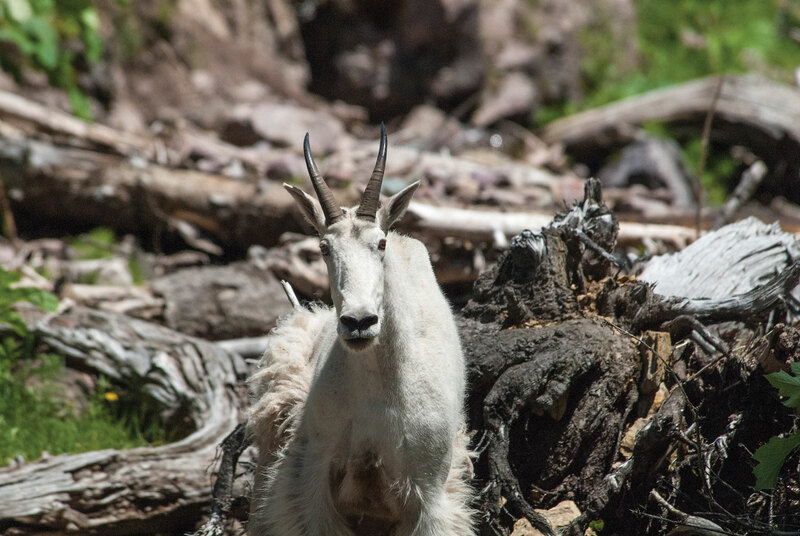 Any mountain goat is a trophy when taken with a traditional bow and arrow, and may just be the hardest earned trophy you’ll ever take. I’m thankful that I was able to experience that wonderful hunt, and thankful that I had the “legs” to do it. 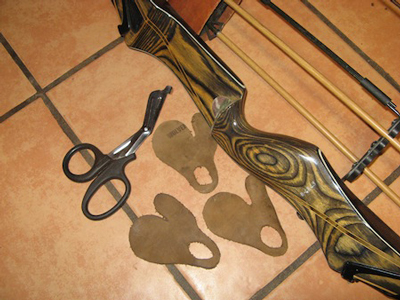 Equipment Notes: The author used 58# to 60# Black Widow recurve bows on these hunts and favors Zwickey four-blade broadheads for big game hunting. Regular contributor Darryl Quidort lives and hunts in central Michigan. He also enjoys trips with friends to those faraway places where adventure awaits the traditional bowhunter.